A self-standing, cubic yard bag. 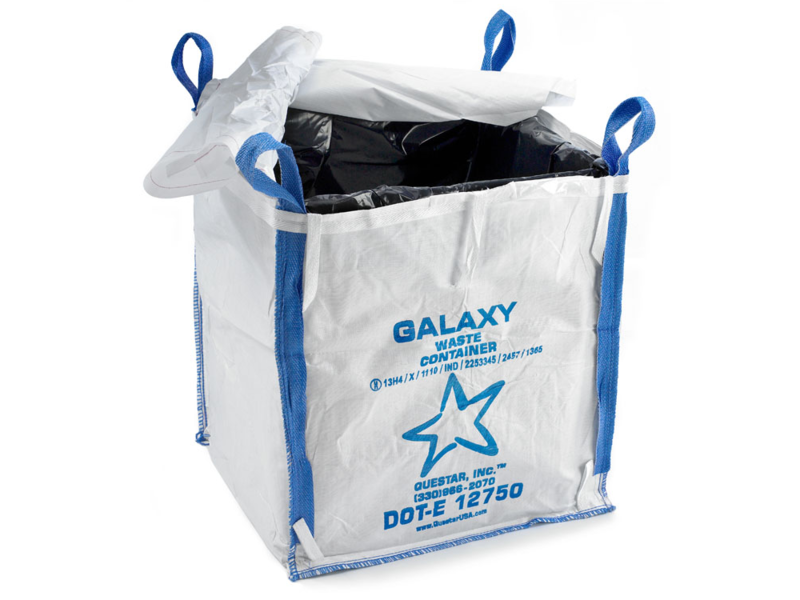 The Galaxy Waste Container is an ideal container for solid wastes with high density weights. Structural fiberboard supports are inserted into each of the four sides of the container to hold the sides open. This feature allows for easy filling. A heavy duty polyethylene liner is included with the container. Flap tops provide for an easy closure. Click Here for Closure Instructions on this item. One Galaxy Bag is the equivalent to four 55 gallon drums. 27% improvement of storage and transportation space. Its light weight lowers disposal costs when compared to 55 gallon drums. Easy to assemble, and close for collection. Provides versatility for multiple projects. Four lifting loops for ease of transport via a forklift. EDCGALAXY 36" (L) x 36" (W) x 39" (H) 3000 lbs. UN 13H4/X/S 15-20 23 lbs. EDCNOVA 42" (L) x 42" (W) x 42" (H) 3000 lbs. UN 13H4/X/S 15 35 lbs. EDCSTARPAK 36" (L) x 36" (W) x 36" (H) 3000 lbs. UN 13H4/X/S 15-20 17 lbs. EDCSTARPAK55 19" (L) x 19" (W) x 31" (H) 960 lbs. UN 13H4/Y/S 65 7 lbs. EDCARK 41" (L) x 41" (W) x 44" (H) 1500 lbs. Non UN Rated 15 22 lbs.